AutoCAD’s dockable windows (or palettes) enable you to access settings and options without having to close them when you’re done. AutoCAD comes with 14 dockable windows, and you can launch most of them by choosing Tools –> Palettes. You can dock, as the name implies, dockable windows or have them float like a toolbar. However, when docked or floating, a dockable window can still take up a moderate amount of space in AutoCAD, which can reduce the available space you have for the drawing window. That’s why you can auto-hide dockable windows. The Auto-hide setting collapses the dockable window when the cursor isn’t over it, which helps to reduce it to the same size as a docked toolbar. Figure 1 shows the common controls that all dockable windows have in common. Manipulating the position and display of a dockable window is similar to manipulating a toolbar. 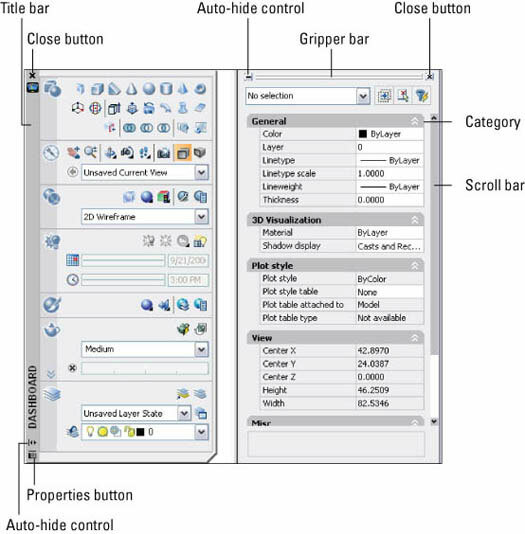 Figure 1: The common controls of a dockable window in AutoCAD 2008. 1. Choose Tools –> Palettes –> Properties. If the Properties window is currently docked, click the gripper bar and drag it over the drawing window. 2. Click the Auto-hide control on the title bar. The dockable window collapses, and only the title bar is displayed. Moving the crosshairs/cursor over the title bar causes it to expand. 3. Click the title bar and drag the palette to the right of the drawing window. Release the mouse button when the preview of the palette changes to dock the palette. Hold down Ctrl when dragging a toolbar or palette to keep it from docking along the edge of the application window. 4. Click the Auto-hide control (which looks like the Minimize icon) to the left of the gripper bar. 5. Close the dockable window by clicking the X button on the dockable window. You can also close the wind by choosing Tools –> Palettes –> Properties.